Well, it’s a bit early for New Year resolutions and all that, but I had a bit of time today so here goes anyway. 1) Defend a village, a Chief and its King: Ages ago when we were making themed Warmahordes terrain I started a TrollBlood Village. I’ve also got Chief Madrack with some trollblood infantry and the Mountain King on the go. All need finishing. 2) Establish a base on a Cradle world : I’ve got about 3K of PHR base coated. It really needs finishing and a force of this size needs a base. The game I played with Steve S on my yellow terrain board was pretty, but the urban buildings didn’t look quite right. Some futuristic buildings will complement the gaming board and my newest army. 3) Recruit allies to retake the Earth : The PHR have the technology but not the numbers. Through careful negotiation an alliance will be formed to eliminate the Scourge from the Big ‘Uns. A second faction will be needed. 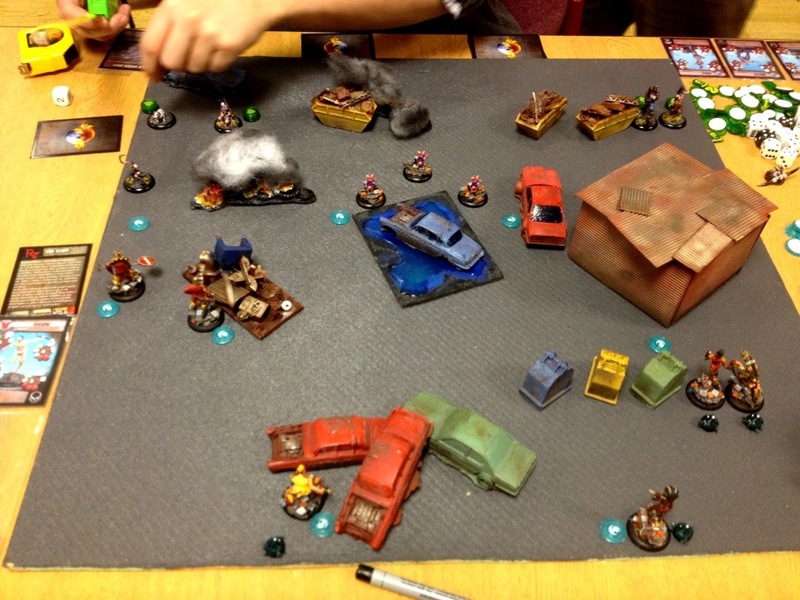 Ok – it’s a new project but I’m loving my DZC and if I love a game 2 factions are a must. 4) Master the art of Urban warfare. I’ve started building some Hawk Resin buildings and I want to finish enough for a decent table. 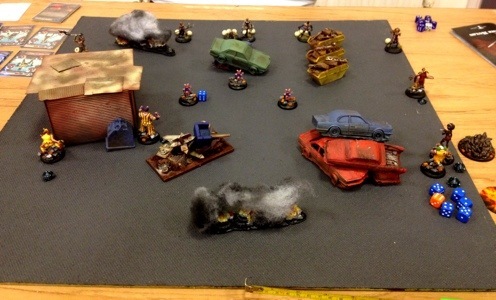 Also a long time ago I purchased and/or cast out the materials to make an urban battlezone. I’m going to try and use this stuff to make a set of modular terrain tiles flexible enough to play DZC, Infinity, 40K or any other urban style game. 5) Tame the Beauty and the Beast: I seem to have become stuck in the Warp when it comes to painting my Dark Eldar. I’m determined to finish my Haemonculus Coven which will include some nice Forgeworld transports and Raging Heroes Sci Fi Vestigals. 6) Survive the Post Apocalyse : I should have the Eden kickstarter before Xmas. I quite like the look of the new Askari faction. As there are some exclusive miniatures and terrain elements in the kickstarter it would be rude not to do some thing with them. Hopefully we can get the Eden Campaign going again and I can lead the giant muties to victory! 7) Conquer the Galaxy – Some of you will remember the Ultimate 40K Campaign – you know, the one where we played Epic, 40K and BFG as part of a bigger picture. This idea still appeals to me. I have been tempted to sell my Lords of Decay but as I have the Epic and 40K components complete I only need a BFG fleet to finish the project. I quite fancy doing this and maybe playing some linked games again. 8) Secure bridgehead on Paradiso: I’ve been drooling over many of the recent Infinity releases. So much potential, but so much patience needed to master the blimmin’ rules! I plan to dig out my Combined Army and add some much needed depth to it. Perhaps I can persuade Eragon (or others) to get some miniatures done and play a short campaign to get used to the system again – possibly even the Paradiso system. It will also mean I get some more use out of the urban terrain stuff I’ve started on. 9) Cross The Breach and raise an army of the dead! 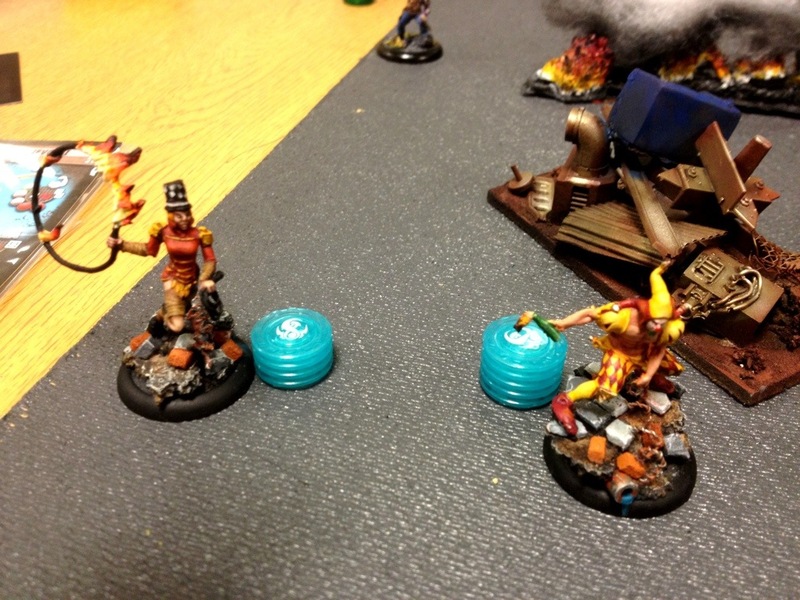 : I’ve got a Malifaux Ressers force partially done but the Warmhordes craze wiped this system off the radar for me. McMourning and his crew deserve some attention and I would like to remind myself of how the game works. I also have some nice Malifaux style buildings and terrain that I bought that never got used so that’s another good reason to cross back over The Breach. 11) Lead the charge of the Mumaks. The scene from the Pelennor fields when a line of Mumaks walk straight over the Rohan is one of my favourite fantasy genre moments. During my brief foray into War of the Ring I accumulated a handful of Mumaks and I still hanker for that feeling of power as I trample all before me in a tsunami of pachyderm rage. It must be done in 2013, along with finishing the rest of my Haradrim army! 12) To be decided. Ok, I’m going to leave the last Labour open – I know I shouldn’t but there will be something cool I have forgotten or an unmissable release next year. Best leave room for just one more pie . . .
And second up on the trophy production line the Eden trophy. 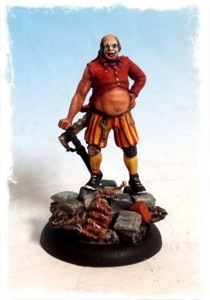 This one is a joint effort with four club members making a contribution by submitting a painted miniature. Delighted that I have the honour of keeping this one until the next Eden tournament at the Big ‘Uns. 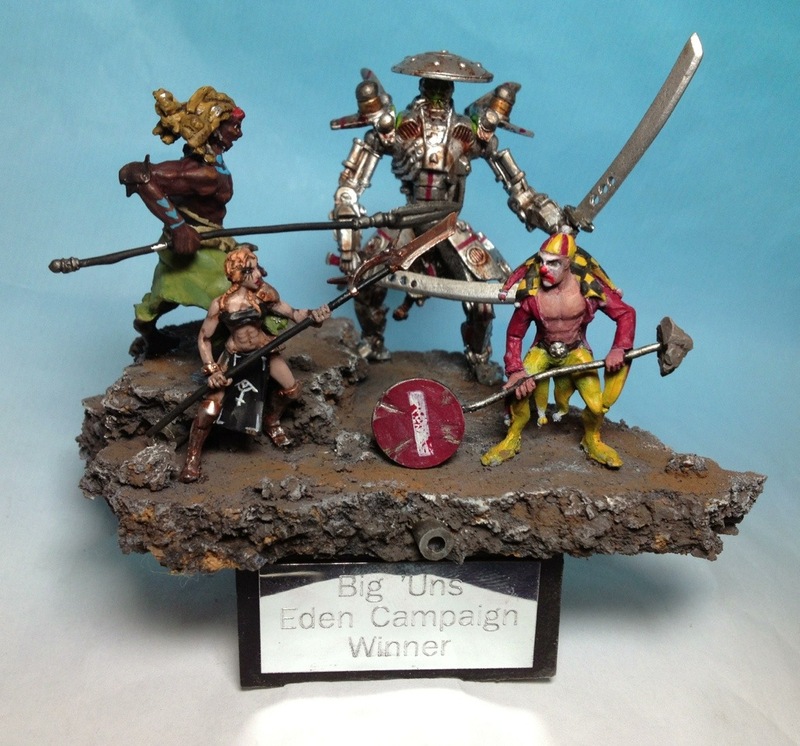 This Sunday was a double bill of gaming and the second game saw my Jokers take the trophy in the local club Eden mini-campaign. In the final game I played the Bamaka clan and the scenario that required me to loot his dead. I fully expected to lose this game as the Bamaka are small in number and very able in melee. With this in mind I deployed all the jokers close together hoping to overwhelm one of the Bamaka and concentrate on looting that model. My opponent deployed his models similarly straight across the board. 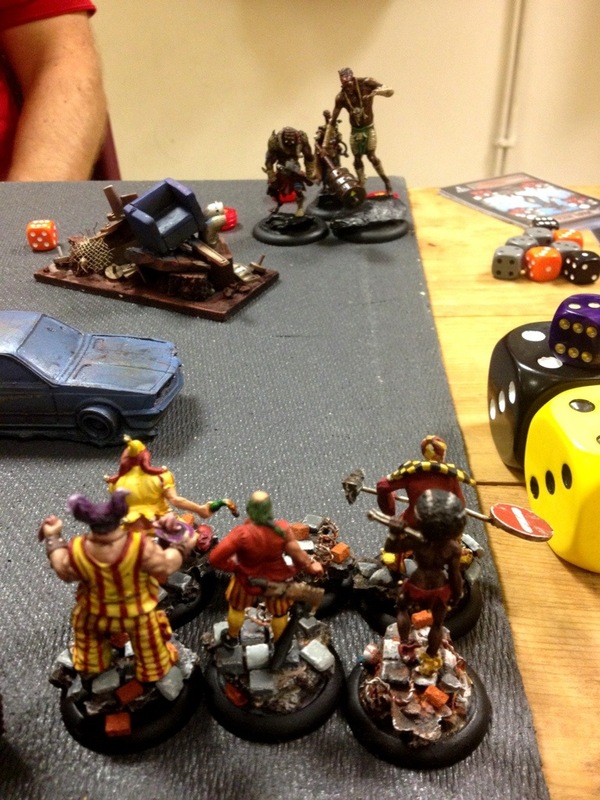 In the event this rather strange deployment worked a treat for the Jokers. Shielded by Stipan’s ‘Insulting Belch’ debuff the Jokers were able to stand toe to toe with the ferocious mutants and eventually take a couple down. As the rest fled for the hills the Jokers were free to loot the dead and walk away with a massive number of VPs. This very healthy win sealed the Campaign for the Joker gang. All that remains is for me to make the trophy! I played my 3rd Dangerous Eutopia game on Sunday. I used my two new Jokers Stipan and Grusha plus Fifi. The opposition was a Convoy gang. The mission was a good one for the jokers as it involved running around picking up loot counters and generally avoiding a full on scrap. In the event the Jokers walked out comfortable winners taking 9 of a possible 10 loot counters home with them. Yuri and Grusha can be seen below scarpering away with the goodies. Having taken heavy casualties in the club mini-campaign I decided to paint up some recruits for my troop. First up is Grusha and Fifi. 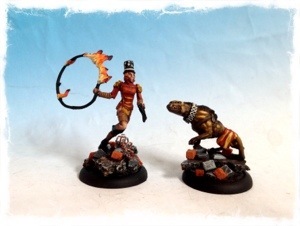 I like the idea of a circus ringmaster and her performing animal but I have to say this sculpt is dreadful. The manufacturers picture looks ok but the production mini is poor. The first problem I had is that she broke at the ankle; next problem was that the hoop was bent out of shape and it is very hard to get it to look right again; finally the details on the tunic are poorly reproduced. Fifi, on the other hand, is a nice miniature and I had no problems with him/her/it. Next up is Stipan. I like Stipan. He is cheap, a straight forward fugly clown with a baseball bat, and he has the very cool special ability ‘insulting belch’. I’m feeling a bit Jokered out now. I have 11 models in my troop which gives me lots of options. Just hope I won’t be raiding the Eden box for more Jokers after the next club game! Making bricks from real bricks! I’ve been painting more Jokers this week. I have taken heavy casualties in the club mini-campaign and need more bodies in my troop. 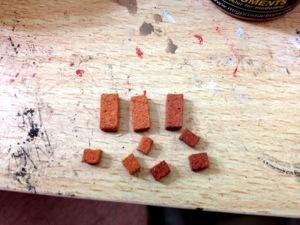 More about the new members soon, but I thought I would make a post about the bricks I am using on my Joker’s bases. I wanted to create a post-Apoc urban ruins vibe for the my joker’s bases. One of the main ways I went about trying to achieve this was my using bricks. These are actually real bricks which have been cut down to a tiny size. I found them in an eBay shop and they are rather nice but not cheap. 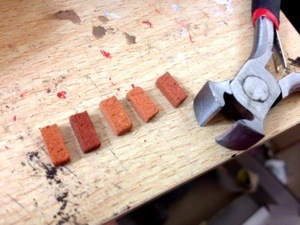 Even these tiny bricks are too large so I cut them down with a set of clippers designed for breaking down mosaic tiles. These have a flat blade to help keep the sides of the bricks straight. 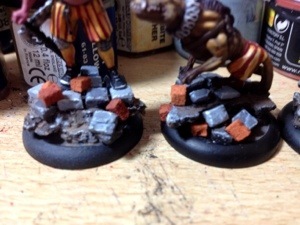 Simply glue the bricks onto your post Apoc base, and voila, with any luck it has helped create the desired illusion. 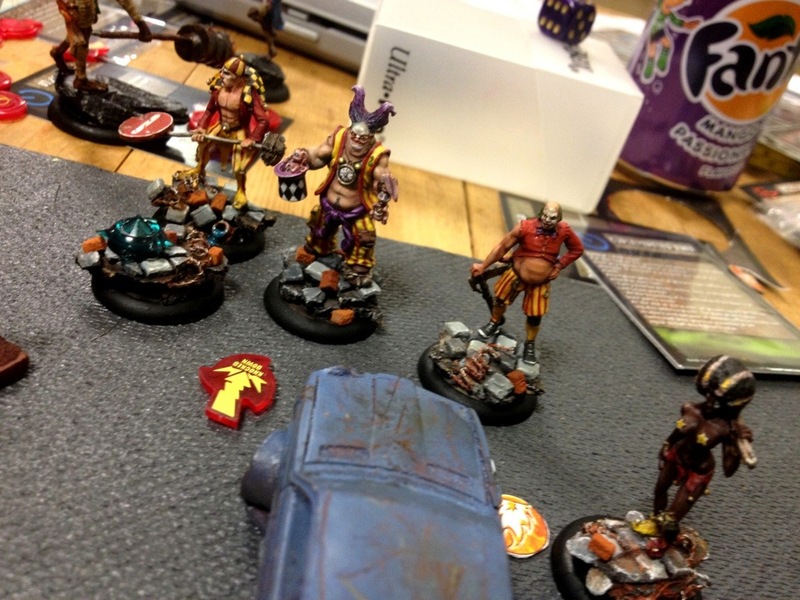 The Jokers faced the Latex Lasses (Matriarchy) in my second mini-campaign game. This time the scenario was The Trap. Just like the last game it was very tight but I managed to eek out a 90 to 85 Vp win thanks to Grigory staying out of the action during most of the game and thus remaining unwounded to score a vital 10 Vp at the end. I also used Yuri as gang leader which I have not done for a while and I was impressed with his knifes and tricksy dodging.